090623 100305 ethanappleseed6 Comments on All Permaculture Principles!?! Ever notice that there seems to be a plethora of permaculture principles? And that every permaculture teachers tends to use a different set? How could this have happened? Is this a lack of consensus in the permaculture movement? Is there a definitive set of permaculture principles? 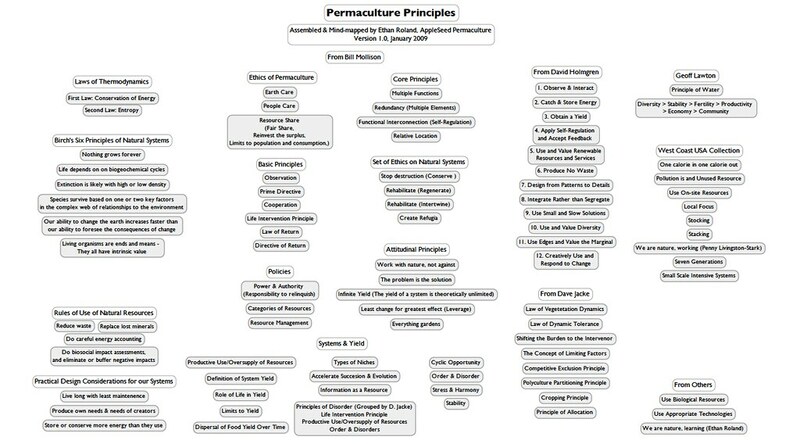 To understand these questions better, I started to collect EVERY PERMACULTURE PRINCIPLE that I’ve ever seen anywhere. I’ve created a first-draft graphic collection of all the principles that I’ve found so far, organized by originator/lineage — take a look below! You can download a .pdf of this first draft at here. What do you think? Is this useful? Have you encountered a principle that’s not on this map? Let everyone know in the comments below! I consider David Holmgren's set to be the "principles" recognised all over the world, while I see the others more as guidelines or paralell (more or less integrated) ideas. I agree that there is somewhat a lack of respect and regognition of the elders – when a new idea emerges, its originator often has his/her own name or organisation attached to it, instead of connecting it to the lineage of the idea, which would make it easier to understand and give cred to others, and coherence to the movement. I having been thinking about your post and I have asked my blog users to support your project. I have created a "Helping others" page on my blog that lists your post. I hope it will help you source more support for your project. TY. Love the blog, I can’t find a way to follow from here. I’ll come back through a different door.